How frustrating! Making mistakes in front of other birders makes you feel foolish, embarrassed, and very self-conscious. But how can you avoid birding mistakes? Just give up trying? Let someone else call out the birds? Don’t lead any more bird walks? Just stay silent every time you are with a group? Stop birding altogether? Hopefully you haven’t considered quitting. Let’s face it. Bird identification can seem pretty daunting. There are nearly 1,000 species of birds on the American Birding Association’s Checklist of Birds of North America. And there are females, juveniles, immatures, and birds taking multiple years to reach adulthood. That’s a lot. And birds rarely ever pose for a birder like they do in the field guides! Often a birder only gets a fleeting glimpse of a partially obstructed bird. Once in an interview I was asked an interesting question “Do you ever make mistakes?” I laughed and said “Yes, of course!” To which my interviewer pursued further “So what was your worst mistake?” Excellent question. And it is a doozy! Once upon a time, not so long ago, and relatively close (Ohio, instead of galaxy far, far away) I was birding with some friends of mine along Lake Erie. It was August I think. And we were scanning mudflats for shorebirds. The late afternoon sun was at our backs and we had good light in our favor. After checking birds in my section (we had divvied up the area) I announced I was going to look for larger shorebirds in the furthermost portion of the mudflats—over half a mile away. I soon came across a bird that made me stop for a moment. It was some kind of waterfowl. It appeared to be looking directly at me. I thought I could make out thin white vertical mark on either side of its bill. I immediately called out “Blue-winged Teal”. Already, I should have known I forgot something. In this case it was August. 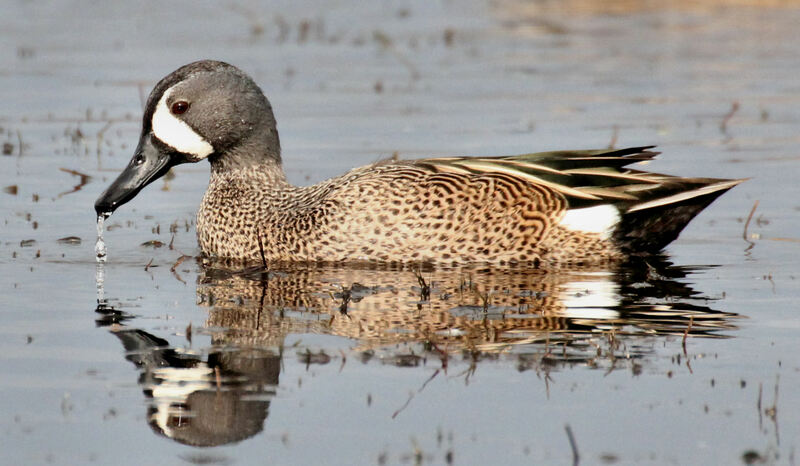 What does a Blue-winged Teal look like in August in Ohio? Yeah. It does not have the white crescents on the face anymore. It is in basic (non breeding) plumage. It should be all brown with no distinct identifying characteristics. The bird was really a long way off. I was pretty proud that I could make out the white on the face of that bird. So I told Kent, “Sure. Here.” And I let him look through the telescope pointed at the bird with it centered in view at the extreme back of the mudflats near some trees. Kent took a long look. It might have been a couple minutes. Finally, he raises his head and asks “Where is the teal in relation to that Canada Goose?” Aack! A Canada Goose? I hadn’t seen any Canada Goose in the entire field of view. Did the scope move? I looked through it again—this time with more care. The bird was still there that I had called a Blue-winged Teal. But it was still in the same position as when I had let Kent look through the telescope initially. Hmm. I looked at the thin neck on the bird and the length of the neck. It was the wrong shape for a teal. It was indeed a Canada Goose. Yikes! That is a terrible misidentification. Why had I been so hasty with my I.D.? I then panned both left and right. And I found more ducks. And none of them were moving either. They were…decoys. And so was my original bird. Yup. My Blue-winged Teal was really a Canada Goose decoy! That was a painfully embarrassing mistake! And yes, you can go ahead and laugh (if you haven’t already rolled around on the floor pounding your fists, shedding tears, and gasping for air in uncontrollable laughter). It’s a funny story. Mistakes happen to all of us who bird. How we handle the mistakes is more related to character than to skill. We all have heard that we should learn from our mistakes. In the early years this used to make me more of a perfectionist. And more introverted, too. But now I shrug it off. Sure. Mistakes are still humiliating. But I realize now that most of the embarrassment merely comes from me focusing on myself and what I think other people are thinking about me. That sounds pretty convoluted, doesn’t it? Really. It is not all about me. And it’s not all about you either. You can’t go through life with the paranoia of what other people think about you. You are never as good as your best bird I.D. And you are never as bad as your worst mistake. Those things do not define you. What does define you is your resiliency—your ability to bounce back. If you are at a place where you never make mistakes then you are at a bad place. If you really do know it all, then you have nothing left to learn. And that is a sad place to be. You might be lonely there, too. <grin> And if you never make any mistakes then you are not pushing yourself to do new things. By this I mean, what are you doing to introduce others to birding? Do you lead bird walks? Do you answer new birders’ questions? Are you introducing anyone else to birding? Even if you don’t consider yourself an expert, many of you can now identify birds that you take for granted, but may still seem daunting to a person who just picked up a field guide for the first time. Because if you open up yourself to leading, guiding, or just helping others it opens the doors of opportunity for more mistakes! Great! No new challenges are without mistakes along the way. But no great achievement ever occurred without a good challenge (AND mistakes). Now, instead of beating yourself up on your latest mistake(s), try swallowing some pride, learn what you need to, and then pat yourself on the back for at least trying to make a difference. Life is full of adventure for those will to take risks and deal with failures. Those folks are well acquainted with mistakes and errors along the way. This entry was posted in Inspiration, Stories and tagged Blue-winged Teal by greg miller. Bookmark the permalink. And this is why we love you, Greg. You still have your sense of humor and humility intact. You allow us to make *missteaks* and keep right on, having fun. When the second -guessers and internet trolls try to take the fun out of birding, you gently remind us: don’t take your self too seriously. Kudos to cousin Kent as well. If God made a better man, he kept him in heaven for good company. What a wonderfully, kind way to help you “discover” what he already knew to be true. Here’s to “Miller Birding.” Let’s all remember to have fun, and be kind.